5 years ago to this day, I started working at Stonemaier Games full time. This is also known as the day I stopped wearing pants to work. As was the case before then–but especially after then–I play a lot of published games, both because I love tabletop games and because I have so much to learn from my peers. I’m going to post my other “favorites” lists later in the year (movies, books, etc), but with the holidays coming up, I don’t think I’ll be playing any new games. So I went ahead and posted my video on the subject today, and I’m going to put the list in writing here. All of the games on this list are games I played for the first time in 2018. Eligible for the list were late-2017 releases that most people (including me) didn’t play until 2018. I’ll just post the games below–I talk about them in more detail in the main video (and in each of their respective videos). What were your favorite games of 2017? Here is last year’s list, and here is my latest overall top 10 list. My video for this topic is below. This entry was posted on Sunday, December 16th, 2018 at 9:10 pm	and is filed under favorites and tagged with board game, favorites. You can follow any responses to this entry through the RSS 2.0 feed. Watched the video last night. Great list . Many of my top 10 were on yours as well. Keyforge, Rajas, Welcome To. 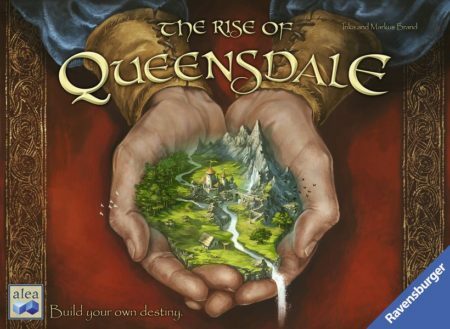 So about Queensdale… How similar is this game to Charterstone? Would you say it is kid friendly, or is it heavier. And how many plays did it take you to get through the campaign. Thanks in advance. Thanks Joe! Queensdale is very similar thematically to Charterstone, but the execution is very different. I played with adults, but I think it would be fine with kids (there’s a lot more text, in case that matters). I don’t have an exact count, but I think it took us around 15-18 plays to complete it. We really liked Queensdale as well. We played through it and Charterstone this year. Was a great year for gaming! Looking forward to getting Rajas of the Ganges on the table soon too.